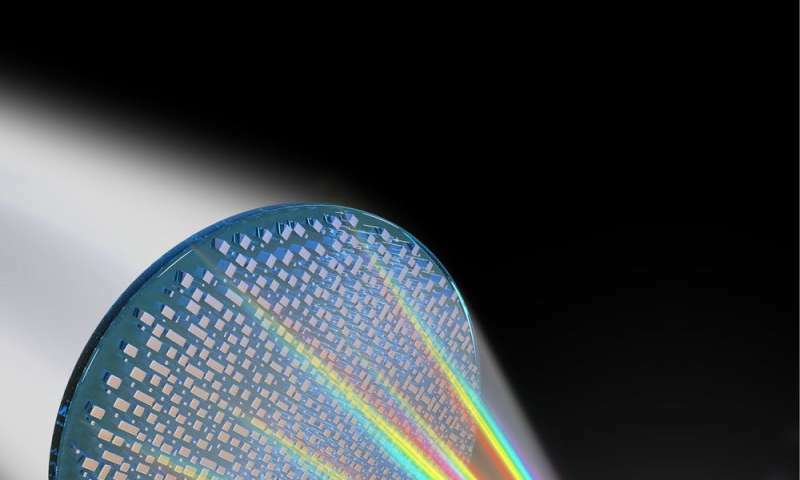 We've figured out a new way to manufacture fully transparent, ultracompact lenses capable of properly focusing every color in the spectrum to the same point. Because our lens comprises specially designed nanostructures, which do not exist in nature, to focus light, we call it a "meta-lens." It has the advantages of being ultracompact while capable of delivering higher-quality imaging across a wider spectrum of light than most traditional lenses, without requiring multiple lenses. For centuries, most lenses for telescopes, glasses and other optical equipment have been manufactured by grinding glass into a rough curved shape and then polishing it to cleanly and clearly bend light. However, these lenses can't focus light of every color on the same point. It is a basic property of light that different colors – or frequencies – travel at different speeds in a lens. They cannot reach the same point at the same time, resulting in blurred images. 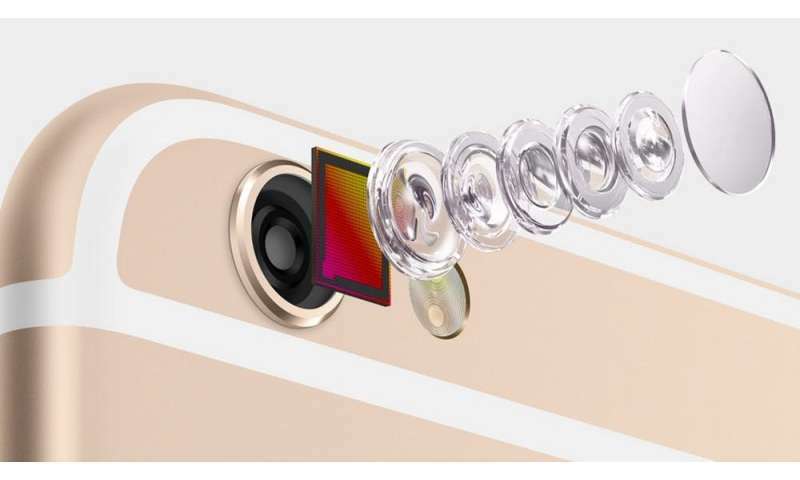 To reduce this effect, commercial lens manufacturers construct complicated optical devices with many separate lenses, each precisely ground into curves and aligned to focus its range of wavelengths in just the right place. However, they end up with large, heavy and complex lenses – nothing that would be easy to wear comfortably as part of a VR experience. To replace these enormous and expensive precision-engineered products, we start with a millimeter-thick sheet of regular flat glass. On it, we place a layer of carefully designed rectangular nanostructures, a million times thinner than the glass layer, made of titanium dioxide, which is totally transparent to visible light. The nanostructures are designed to bend incoming light rays by increasingly greater angles the farther they hit the meta-lens from its center so that all rays are focused in the same spot. To secure the nanostructures onto the glass substrate, we use lithography, a technique widely used to mass-produce computer chips. In 2016, we showed that using flat glass with nanostructures could focus light of one specific color just as well as a traditional curved lens. But in that research, what we made suffered from the same age-old problem as curved glass: Each color focused on a different location. To have our flat lenses form high-quality images, all the light – regardless of its color – must focus on the same point. In our latest work, we design a more sophisticated set of nanostructures, which even on a flat surface can do much more than a traditional curved lens. The nanostructures still bend the light at higher angles the farther from the center they are, but with an important modification inspired by a key insight. After leaving the meta-lens, the light has to travel to the focus point, which is farther from the edges than it is from the center of the lens. To travel a longer distance in the same period of time, that light has to travel faster. 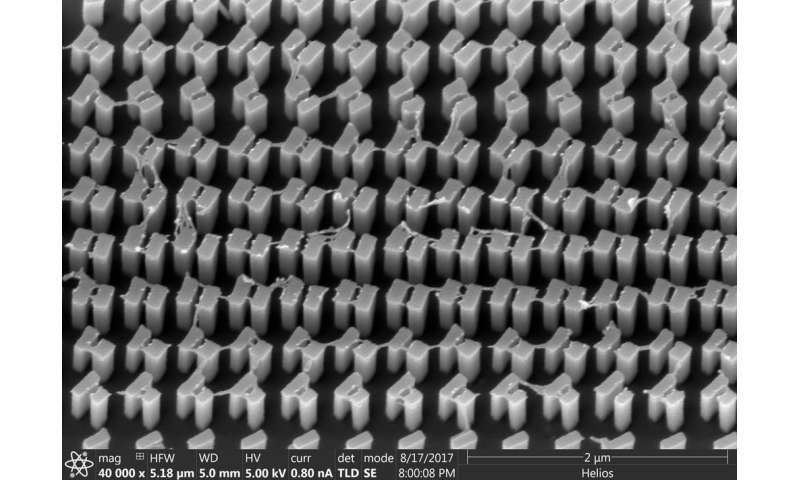 So we built some nanostructures that transmit the light more quickly, and others that do so more slowly. We put the faster-transmitting nanostructures at the edges of the lens, so light travels through them faster than in those in the middle. This effectively helps the light from the meta-lens edges catch up with light at the center, so that all the rays focus together. This approach can be modified for any number of specialized situations, allowing construction of meta-lenses that have a wide range of properties, such as the ability to affect certain colors but not others: A custom-designed nanostructure can make that adjustment relatively simply, without the constraints or complexities of polishing curved glass lenses to highly precise specifications. Once designed, meta-lenses can be created as part of a wider mass production process: for instance, of VR headsets or augmented reality glasses. They can also be used in place of more expensive ground-glass camera lenses on smartphones and laptops, reducing weight, thickness and cost of portable devices. It may seem surprising that the centuries-old challenge of multi-color focusing can be solved by a thin piece of glass underneath nanostructures barely visible to the human eye. But indeed, the meta-lens approach can provide what all those bulky traditional lenses cannot: a clear image across a broad range of colors.